W. Main St. & W. 2nd St.
We know you want your dining experience to include great food and a warm atmosphere with good friends. Whether it’s a casual lunch, hand-crafted cocktails, dinner with friends, or a special occasion, make Nick Ryan’s your next dining destination! Try Nick Ryan's famous burger, Southwest Grilled Chicken Salad, Salmon with Jasmine Rice and fresh vegetables for lunch. 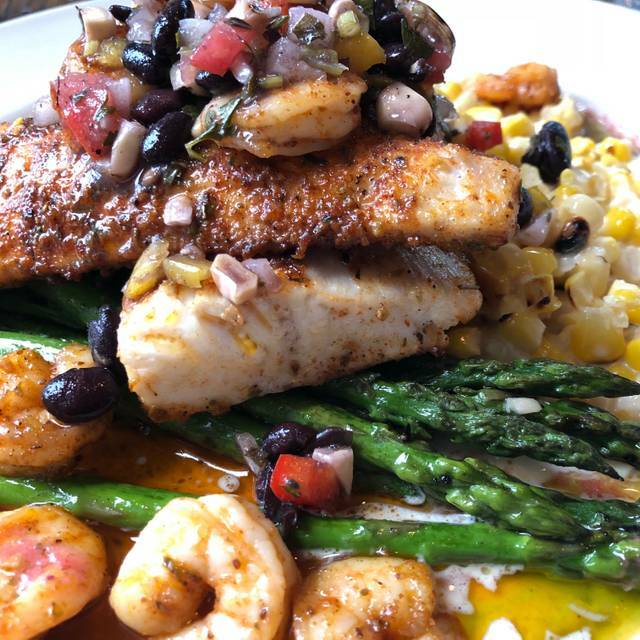 Dinner entrées include Blackened Mahi-Mahi, Chicken Roulade, Shrimp & Grits, Filet and many more. Nick Ryan's also offers fun items like an open-faced sandwich known as the "Hot Brown," a signature Kentucky dish stacked high with turkey, ham and bacon and drenched in Mornay sauce. If you find yourself feeling extra indulgent, you can finish your meal off with a decadent dessert martini. Cougar Bait beer battered cod or grilled Mahi Mahi, cilantro slaw, pico de gallo, queso fresco & Valentina hot sauce. Served Rhode Island style, tossed with pepperoncinis & crushed red pepper. Choice of lemon aioli or marinara dipping sauce. Seared to a perfect rare and served over sesame soba noodles with arugula & ginger soy sauce. Grilled French baguettes topped with fresh tomato, mozzarella cheese, basil & balsamic reduction. A sampling of our truffle oil & herb hummus, cucumber dip & house-made Kentucky beer cheese. Served with a variety of fresh vegetables & flat bread. A blend of chorizo, Italian & andouille sausages baked on a crostini with Mozzarella then topped with Parmesan cheese, chimichurri sauce & served with a side of marinara. Hand cut fries topped with our house-made Kentucky beer cheese, crispy country ham bits & scallions. Crispy fried shrimp tossed in a spicy Asian aioli & served with iceberg lettuce, fried tortilla strips & wasabi crema. Our unique and delicious version of a traditional dish. Drizzled with pink peppercorn honey and served with a spicy BBQ dipping sauce. A large portion of our hand cut fries with your choice of seasoning. Garlic Herb, Rosemary Parmesan or Nick's special BBQ. Add Chicken $4; Shrimp $7; Salmon $7 to any salad. Fried chicken, crispy bacon, egg, tomatoes, shredded cheddar cheese, cucumber & choice of dressing. Arugula tossed in raspberry vinaigrette, then served with roasted red & golden beets, toasted hazelnuts, cherry tomatoes & a honey goat cheese. Mixed greens, cucumbers, tomatoes, red onion, croutons, bacon, shredded cheddar & choice of dressing. Tossed in a raspberry vinaigrette with slivered almonds, blue cheese crumbles & dried cranberries. Grilled chicken, roasted corn, black beans, tomato, avocado & fried tortilla strips on a bed of mixed greens tossed in a chipotle avocado ranch. Tossed in a bacon vinaigrette with green apples, candied walnuts, egg, tomatoes, & smoked Gouda cheese. Romaine tossed with Parmesan cheese, croutons & Caesar dressing, then finished with a Parmesan crisp. Local bourbon brined chicken drizzled with pink peppercorn honey served with country green beans & Yukon gold mashed potatoes. A classic Kentucky dish of country ham, roasted turkey & toast, topped with bacon, tomato, cheddar cheese & Mornay sauce. Cougar Bait beer battered cod served with fries, tarragon tartar sauce & coleslaw. A juicy half pound burger with lettuce, tomato, onion & pickle. Choice of one side. Grilled or fried chicken breast sandwich topped with diced jalapeños, beer battered onion rings, spicy BBQ sauce & homemade beer cheese. Choice of one side item. Grilled to perfection served with asparagus, fried Gnocchi and your choice of bourbon demi-glace or maitre d'hotel butter. A generous cut of Certified Angus Buckhead beef, sautéed fresh haricot verts, garlic herb fries and your choice of bourbon demi-glace or maitre d'hotel butter. Served over savory Parmesan cream corn and topped with an avocado, tomato & black bean salsa, then finished with a hint of chive & raspberry oils. French cut & bourbon brined garnished with a roasted granny smith apple & caramelized onion reduction. Served with smoked gouda grits & asparagus. Low country style with andouille sausage, poblano peppers, & mushrooms over smoked Gouda grits with a spicy creole sauce. Wrapped with Prosciutto ham and stuffed with Brie cheese, pan seared then topped with Brie cream. Two petite crab cakes garnished with a mustard cream sauce. Served with fresh seasonal vegetables and roasted garlic fingerling potatoes. Slowly smoked, then braised in our local Shotgun Wedding Ale until fork tender. Served with Yukon Gold mashed potatoes & country green beans. Angel hair pasta tossed with fresh spinach, shiitake mushrooms, prosciutto, red onions, garlic & basil in a white wine sauce. Finished with shredded Parmesan cheese. There were 4 of us, from different states, in Lexington for a business trip. We had received a book called "Beyond Grits" from one of our clients. Since the weather was so good, we wanted a venue with outdoor seating and Nicks was our choice. Perfect! We'll pass the information along to our colleagues as a place to give a try when they're in Lexington. Very friendly service. Nice menu with several good choices. Food was tasty, as was cocktail from their specialty menu. It had been a while since we had been here. The food was really good, and I especially LOVED their cream corn. You can tell it's freshly made. I'll go back just for this side! And the burger was good also. Fish and chips and fried chicken was fantastic. Fantastic experience. Loved the food service and ambiance. Food was amazing. Thank you. The restaurant smelled like the sewer was backed up so we had to leave. We had a bottle of wine and trio hummus dip while we tried to find another restaurant. The dips were packed in their serving containers for awhile in the refrigerator and were too hard for the corn chips. Celery served with dip had brown ones mixed in. Some chips were stale some were fresh. I am not sure how any one was able to sit with the smell and enjoy a nice dinner. Sad experience. Staff was friendly, building is nice looking from outside. I ordered the salmon and asked for it to be blackened. It was some of the best salmon I’ve ever had. It was accompanied with really great risotto and veggies. We did order the buffalo chicken appetizer. It was served with a ton of celery and baby carrots and tortilla chips. All very fresh and yummy. However there were probably 3 tablespoons of buff dip. Sorry, for $9 I expected more dip and less veggies and chips. It was flavorful but not much there for the price. Food was just OK. Probably will not go back anytime soon. Wait staff was very nice. Probably my favorite restaurant in Lexington. It’s the place I recommend to friends and family when visiting. Great menu, food taste terrific, good bar choices, great waitstaff. This past trip I got 2 Nick’s tacos and bowl of chili. It was delicious. Really enjoyed the restaurant. We arrived around 5:30 and no other diners were there. A few other diners came in around 6:30. The service was good and we loved the old house ambience. I ordered the hot brown and thought the sauce would be more creamy and runny rather than thick. The flavor was good. My husband ordered the salmon and thought it was good. We shared a house salad which was very good with delicious dressings. He also ordered a flight of bourbon which was tasty and priced reasonably. I had one glass of wine and total bill was $70. We would definitely go back. Was a very nice little restaurant. Food was good. Prices on drinks were very reasonable. Service was good and attentive. Will return again when in Lexington. This made our second visit to Nick Ryan's since our daughter started at Transylvania University this year. Both times the food was just ok and service about the same. This time, was by far the worst experience. Had to call the day of to try and confirm reservations because their answering machine still stated the old message from being closed due to the water line break. When ordering they were out of a lot of basic menu items. Then when I tried to order a martini that was on their website, was told they no longer had those. We received our appetizer before my drink even came. What a shame, this place looks to offer a lot but truly disappointed again so won't go back. Wonderful service! We were the first to dine in over a month due to some water damage. They were quick, friendly, amazing prices, and wine and bourbon selection. I will definitely visit again when I am in town. My only suggestion would be to make sure the website is up to date. First: Do not go to this place when UK plays. There is no parking anywhere near the restaurant. Second: The menu on Open Table is not correct. Don't expect the same menu when you get there. Overall it wasn't bad but I won't rush to go back. The appetizer portion sizes were on the small side. They were ok taste wise. Every one of our entrees was served lukewarm. The food was decent but no better than an Applebee's or similar chain place. Be careful in you want a steak, only served with dinner menu. Went before a 6 oclock UK game, but learned that steak is not on the lunch menu. Other than that was fine, but was really in a mood for a steak, and had bragged to my friend who i met there from louisville that the fillet is really good. We ended up with hamburgers. Service: Average for this occasion; previous dining experience was simply excellent! In any event, no problem with dining here in the future. We love eating at Nick Ryan’s when we come to town. Great food and great service consistently! We got there very early in the evening. Was fine by us. I prefer avoiding crowded places when I can. I had looked at the online menu the night before and was looking forward to the brisket, mashed potatoes and green beans. They didn’t have it. Only BBQ pork brisket. I wS bummed but ordered crab cakes. I had them before but these had a creole sauce. It was good but not my fave. I did get the goat cheese beeet and arugula salad. Yummm! Bought 2 to have this weekend. Overall it was good but not my top experience at Nick Ryan’s. It always takes way too long to eat at Nick Ryan’s. If you are going to the game, consider an alternative. on time, food was very tasty, and easy to get to rupp for the basketball game. food was good cocktails word as well, but they do not offer a single Moscato or sweet wine to drink which was very disappointing to my wife. Since that is all she really drinks kind of left her unable to enjoy any wine during the meal I would think Moscato would be a popular choice to have at a restaurant. grilled salmon that cones on a bed of risotto and veggies. The salmon was grilled perfectly and tasted great. The risotto was watery and had absolutely no flavor. Also, the veggies didn’t have any flavor. Service was excellent and quick. We had plenty of time to get to Rupp Arena. Good place to eat and they accommodated us on a very busy night. My son and I were in town for a UK game and made reservations at Nik Ryan’s. We had been once before last year. There are many great dishes to choose from. I had shrimp and grits and my son had grilled salmon. Both meals were delicious. We finished with a hot brownie. I enjoyed a craft cocktail. Our waitress was very nice and professional. Monday night was a very slow night at Nick Ryan’s..only my group of 3 and another group of 10-12 were in the restaurant. The corn poppers (or fritters) were delicious. My friend & I discussed splitting a salad, in addition to ordering our entrees, but we were told the salads were rather small, so we each ordered our own. The salads we received were quite large, so we really could have split the salad. I ordered the pork chop, which was good, but a little on the dry side. One friend ordered the salmon which was good. My other friend asked whether the shrimp & grits or crab cakes were better. She said the shrimp & grits definitely were better than the crab cakes & were not too spicy. The shrimp & grits dish was way too salty...enough so that the waitress gladly said she would let her order something else. So, she ordered the crab cakes as a substitute. Unfortunately, the crab cakes were horrible...way to salty and there was no substance to the crab cake...it was just a very salty mush. The manager and waitress both apologized & agreed that both dishes were unacceptable. We were not charged for either of those entrees. I typically like going to this restaurant, but I think I will hold off for a while. I've only heard good things about Nick Ryans and we were glad to finally be able to schedule a date night with friends to try it out. It did not disappoint! Our server was great, service was quick and the food and drinks were outstanding. We will be returning! The Fried Chicken is AMAZING! Bourbon flights were great also! The NYE set Menu was a joke, $65 for a thinly sliced scallop, the worst Cesar ever and a dry corner piece of white cake. Although the filet was good the 3 other poor courses and the hot white wine ruined the evening. Nick's is a favorite. Friendly, cozy, good food without being overly fussy and always friendly service. The salmon was cooked perfectly and the veggies were very tasty. Service was wonderful and the location is convenient to downtown. Full bar. Best steak ever! All the food was great! It’s been a while since we have been here but it was excellent from beginning to end, especially if you prefer things a little spicy. I was pleased with the service, but the waitress got two of our orders mixed up. Then, the chili order was very small as was the shrimp and grits....overall, not bad, but not the best.